This is a picture of some pie. Photo by me. Your weekly helping of Dallas dining news. The Dallas Zoo is hosting a wine event: You can hang out with animals and drink wine at the zoo on Sunday, March 31. Sounds like more fun than an oak barrel of monkeys, amiright? On Sunday, March 31, from 6 p.m. to 8:30 p.m. we’re hosting Corks For Conservation in the Giants of the Savanna. Guests can stroll through our Savanna at sunset while sipping South African wines and sampling perfectly paired, locally source bites. Along the way, they can feed giraffes, experience a lion-feeding demonstration, and learn about our animals and how the Dallas Zoo is working to protect their wild counterparts. Guests can also get up close with our ambassador animals and bid on a special elephant experience in a silent auction. And the best part, all proceeds will go directly to our wildlife conservation fund to protect endangered species across the globe. The event is 21 and up. Tickets cost $150 and can be purchased here. Merit Coffee to open in Dallas: Robby and Neesha Grubbs, the dudes behind San Antonio-based Local Coffee, along with their partner Bill Ellis, will open two coffee shops in Dallas. …Two upcoming Dallas cafes will open on March 26 in Deep Ellum and April 2 in Highland Park. Merit’s expansion into the Dallas market follows the brand’s successful expansion into Austin last year. Merit Coffee’s mission is to serve the best coffee available anywhere and deliver it with warmth. Renowned Austin architecture and design firm Michael Hsu Office of Architecture designed the two Dallas locations. The modern, light-filled spaces both feature a palette of white powder-coated steel, warm natural wood and navy-blue accents. The Deep Ellum location will be the first Merit location to feature a full training lab for wholesale partners. The Deep Ellum location is 2639 Main St., Ste. 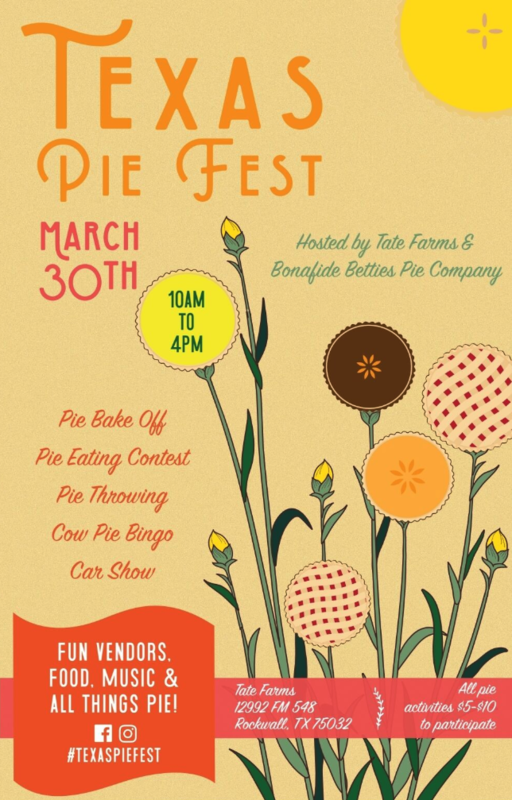 140 and the Highland Park location is 4228 Oak Lawn Ave.
First-annual Texas Pie Fest at Tate Farms: On March 30, Tate Farms will host the first annual Texas Pie Fest. The event includes live music, pie, and additional food (which is not pie). Pie shops from all over Texas will be featured in this event. Famous local pie luminaries include Bonafide Betties Pie Co., Royers Pie Haven, Come and Bake It, and Dallas’ favorite Emporium Pies. Guests enjoy a pie eating contest, pie baking contest, pie throwing, cow pie bingo, vintage handmade vendors, and a car show. Local vendors include Wrecking Ball Creative, Hazie Sue Vintage, Knot So Dope, Whiski Designs, and many more.